Mara Revkin’s article in the Washington Posts’s Monkey Cage, How Militants in Iraq and Syria Recruit and Use Children, is a deep look into the recruitment and use of children by armed groups in Syria and Iraq. “The study includes evidence from in-depth interviews with 144 individuals, including 16 children and 33 adults currently or formerly associated with armed groups, and a pilot survey of 45 Iraqi children detained in a juvenile reformatory in Irbil on charges of joining the Islamic State. All names or identifying details have been changed to protect those interviewed. 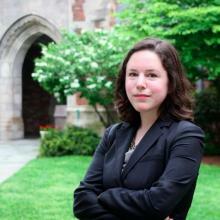 Mara is a PhD student in the Department of Political Science at Yale University and a Jennings Randolph Peace Scholar at the U.S. Institute of Peace.